In our last newsletter, we introduced Nikon's new macro flash. At the time, we could only go by the specs that Nikon had published and they looked good. But after putting the flash through our testing (with Nikon's new D200), we have both good news and bad news. First the good news - the wireless iTTL system works very well. It is available in two configurations depending on which Nikon camera model you own. 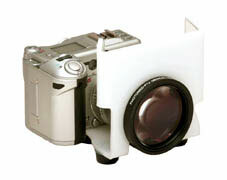 The unit shown in the photo above uses a wireless module to control the individual flash heads at the end of the lens. If you own a D70s or the new D200, the camera's built in flash system acts as the wireless controller. 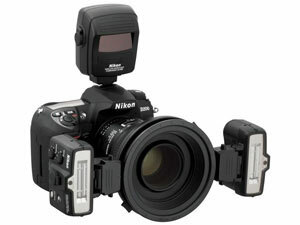 Now the bad news - the flash heads, as they are mounted in Nikon's mounting ring, are too far apart for intraoral views. The flash heads are almost nine inches from each other. Anterior views are fantastic as the flash heads are positioned like a small copy stand, but when you try to take a posterior closeup or a mirror shot, there is too much light being blocked by lips and cheeks. We are investigating mounting the flashes on a different bracket to get the flash heads closer to the lens. Watch for info on this item in future editions of this newsletter. that was D-TTL or iTTL with Nikon digital SLR cameras. We are looking forward to offering the D200 with the Sigma flash. of the larger SLR cameras. on new ones) and they are $200 less expensive. The refurb G6 packages sell for $1295. We still include all of the items that are included with the new G6 including our 30 day return policy. When they're gone, that's it. The Chicago Dental Society's Midwinter Meeting has become one of the largest dental meetings in the U.S. and is one of the best showcases of "everything dental". PhotoMed will be located in booth #442 and we will be demonstrating all of our cameras as well as showing all the new products listed in this newsletter. If you already own a camera, why not stop by and check out our extensive selection of intraoral mirrors, retractors and other accessories that you can't possibly live without. PhotoMed is proud to add the DoctorsEyes line of L.E.D. Ringlights. These L.E.D. Ringlights are the perfect solution for almost all of the digital cameras that we have not been able to adapt with standard macro flashes. The L.E.D. Ringlights are available in three sizes (for different size cameras) and there are multiple power pack options. we can determine which model is right for your camera. In 2005, the AACD announced their digital protocol for images when submitting cases for accreditation. To make this process as easy as possible, we are offering training guides for two very popular software programs: ThumbsPlus v7 and Adobe Elements v4. Each book "walks" you through the process with a screen shot by screen shot, click by click format that makes it easy for anyone to quickly learn the process.